A little black cat has been visiting me. Sometimes I find him asleep on my back porch in the mornings. I put a blanket and a box out for him just in case he gets cold. He belongs to a lady in the next street. Her house backs on to the same lane as mine does. I have taken her cat, Bertie, home several times, but he is a happy wanderer and keeps coming back. I wonder why Bertie has chosen our house to visit. It’s not that I mind, it just intrigues me because the thing is Bertie looks exactly like my old cat, Olive. Exactly. He also behaves like she did. The way he moves his ears or flicks his tail. The way he jumps through the grass. His eyes, his whiskers, the obsidian sheen of his coat. They are all like Olive. Of course, many of the things Bertie does are characteristic of cats the world over, but there is one thing that has made me internally gasp a little – Bertie doesn’t chase the birds that come to the garden. I thought that’s why he had come at first – to chase the birds – but he doesn’t chase them. Olive didn’t, either. Bertie just sits on the porch, usually on the chair with the comfiest cushions, and purrs. Just like Olive used to. Now I’m not all kinds of crazy here. I’ve seen black cats before and while I’ve liked them I have never had that sense of familiarity I have encountered with Bertie. The sense of I know you, don’t I? So here’s my question? Can cats come back? In a reincarnation sense. Cats are mystical creatures. They are prominent figures in mythology and superstition. We all know how much the Ancient Egyptians revered them and we’ve all heard about the black ones in particular being the preferred familiar of a witch. I have always thought cats were half-in and half-out of this world, able to exist in two planes at once. They certainly know things we don’t. It makes me wonder if it’s possible that Bertie is actually Olive. To my surprise, many people have experienced the same thing. Olive has been dead for ten years. I think of her occasionally and I miss her but I don’t obsess over finding another cat exactly like her. I don’t think I am indulging in a bit of wishful thinking. After all, it was Bertie who found me, not the other way round. And he is someone else’s cat. So am I a barmy cat lady? Or is there more to all this than meets the eye? What do you think? Can cats come back again? Or am I just reading too much into the friendliness of a neighbour’s cat? I’m wondering why Pythagoras, the cat of our former next-door neighbours spent more time in my garden than theirs, even though we aren’t really cat people. And, when they moved away, the damn’ animal walked here from Warminster … about 30 miles. Haven’t seen him since we took him back, though. You are kidding me. A cat that wasn’t yours walked 30 miles to your place? That cat was obviously attached to you. What an incredible story. Cats really are mysterious creatures. Absolutely. I just can’t help but wonder about this whole reincarnation thing. And then there’s the nine lives factor. I have seen cats defy death over and over. Some of them really use up their nine lives. Such intriguing animals. 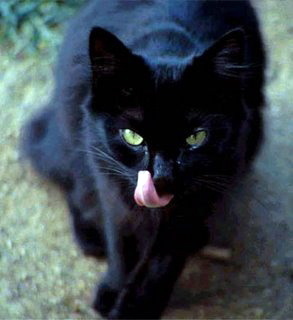 Oh how sweet, cats are mystical animals indeed…. Gorgie City Farm now has a resident cat that used to belong to a neighbour but when the neighbour moved the cat walked back to Gorgie City Farm and stayed…. I’m not sure what I think but I do know cats are their own people. I had a cat once that left for 6 months, came back for single day as if everything was hunky dory and disappeared forever. What was that about? I once read about a lawsuit between two people because the owner’s cat kept living at the neighbours house. The judge ruled that cats have no owners. I absolutely believe that animals of all kinds can, and do, come back. I also believe that most cats decide where they belong regardless of where their “owners” live. Bertie obviously likes you, your energy and your space, and has decided to bless you with his presence. Enjoy his visits–he sounds like the perfect guest! I know they can come back. What a lovely post Sel. Thanks for your comment and email re: the passing of our beloved Mitzi. I hope she stops by to let us know she’s ok. Her presence is sorely missed. I love cats..but I love dogs and birds too. each are different…offer a different beauty and forge a different bond with humans. all i can tell you is that after my beloved feline Tounces passed, I was flipping through a magazine…maybe like within six months after he passed. I stopped dead. There in an ad was the spitting image of my baby full face making the same damned expression he used to. What’s odd is that he had an unusual marking on his nose — almost diamond shape — but not quite. This ad cat sported the same marking. I am sure it was him letting me know he was OK…and saying “hi, ma” to me in his own way. I don’t see any reason why cats could not experience another incarnation. Why not? Every being is a manifestation of the one Supreme Being– so in that sense if humans reincarnate, then cats can too. They are mystical. I love that story about the cat that moved into the farm. They certainly know what they want, don’t they? LOL. And you never saw that cat again? What a story! I love that story about the judge. That is priceless. They are true independent spirits. I agree with that. I do think cats choose who they belong to. I am lucky that Bertie is coming to visit me. He is a sweet little guy. I’ll enjoy it while it lasts! Thank you for saying that. If I thought that Olive had actually sent him it would be such a comfort to me. I always felt good with her around. I do think we get messages from the afterlife if we’re open to them. It does make me feel that death isn’t the end. No way! What an incredible story. How uncanny. That was definitely a sign. It must have made you really happy! You are so right. Why not, indeed. Definitely. The more I read about it and after hearing everyone’s experiences I am becoming more and more convinced it can happen. WOW! Pleasantly impossible ponderations in so much as the answer to your question is unknowable but very nice to roll around in the brain like catnip. Why not Sel? My mind is always open to possibilities and I like the idea of our beloved pets coming back to us somehow. Enjoy Bertie. He sounds like he enjoys being with you. Selma….thank you so much for your feedback. I had a long talk with a friend last night who is an editor about a theme I could pull together some of my pieces (after some good editing though….everything I post on my blog is first draft stuff, so it needs culling…!) I appreciate your support. It means a great deal. I like the idea of it too. There are so many pets I have had that I would love to see again. It’s nice to think that they still might be around! Oh, Bertie and Olive have definitely met. I am sure of it. It was my pleasure. I meant every word. I do think you have the makings of a book on your hands. It would be brilliant if you got it published. I definitely think there is a thematic link with much of your writing. Many of your posts have provided me with real ‘Ah-Hah’ moments. I think your writing has quite broad appeal in the marketplace. Why not give it a go? I suppose my stories do have common threads. I am currently working on getting a paid weekly gig in a local paper which will very much be along the lines of what I write here. I’ll keep you posted. Best of luck with everything, hon!